Are you a blogger or developer who wants to create a beautiful website with easy? If you want to build a website right from the scratch it is really a tedious task and consumes much time. You need to know coding and lot of technical stuff to deal with it. Coding for a website is actually a tough job even for the advanced developers. In order to make your task simple WordPress page builder plugins comes into existence. Using the WordPress platform itself is easy for the developers to build a website. With additional using these plugins even WordPress beginners can build a wonderful page layout. It completely comes with drag and drops functionality. You have just held and drag to create an amazing web page. These plugins allow you to create, edit, and customize your website layout with ease. It is very helpful for the developers who want to speed up their production. Page builders changed the complete process of building a web page for your website. It is very flexible to use and comes with many features to helps you to build the desired page as you wish. 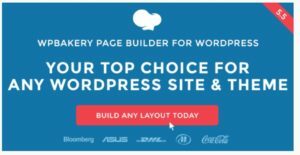 1 What is WordPress Page Builder? The WordPress page builder is actually a plugin that helps you design layout of the website with complete drag and drops features. You can even make changes to the structure of the page. It comes with flexible features that are very easy to use even for the newbies. Before page builder came into existence, building a page is not that easy task and it takes much time to complete it. But with this page builder, it cut down your task entirely and speeds up your website process as well. You don’t have to know any coding to work with it. Instead of codes everything has come with the drag and drop pre-made widgets in the pages/posts area, you have to just rearrange them to build wonderful pages. You can create a unique web page with the page builder. It also has an advanced page editor that completely changes the look of default post/page editor in WordPress. With this advanced page editor, it comes with the pre-made widgets, components, and content blocks. It actually functions like a widgetized sidebar of a WordPress theme. Page builder lets you add any type of content in the form of widgets in the pages. You can add how much ever widgets you like and arrange them just by simply drag and drop. Important factors to be noted in page builder plugins are it should be compatible, responsiveness, SEO, ease of use, ready for translation, Supports CSS customization, and many other unique features. In this post, we have made a collection of best drag and drop WordPress page builder plugins that do wonders in creating a beautiful web page. Elementor is another excellent and popular page builder plugin for WordPress. This plugins speed and responsiveness are extremely amazing. It is a front-end editor that helps you see the changes lively. Creating sections is very easy with this plugin and you can also select the number of columns for each section. The drag and drop feature in this plugin leads you to the next level creation of designs. You can use this plugin with any theme and on any post types. It gives complete customization where you can change section width and height, column and content positions, padding and margin settings etc. This theme comes with 400 unique icons, 600+ Google fonts which helps you to build a unique web page. This plugin lets you choose from basic text and image widgets to advanced such as sliders, accordions, tabs, social media etc. The plugin is completely free but comes with plenty of features. This plugin has an extensive template library where you get 100+ beautiful WordPress templates by their top-notch designers, and you can export themes to different websites through this page builder. The notable features of this plugin are canvas, maintenance mode, and zapier integration. Elementor is mobile friendly and optimized and works fine on all the devices. The plugin comes with special settings for mobiles and tablets. This plugin allows you to create custom CSS for your pages and also supports multiple languages and RTL pages. The pro version of this plugin comes with three pricing $49, $99, and $199. This plugin is built with PHP7 and the latest coding standards. It comes with 28 widgets and also allows you to add widgets from other WordPress plugins. This plugin comes with additional features such as mobile editing, revision history, settings and style tabs, multiple templates, save and import/export templates, global elements, WooCommerce support, slider editing, and lot more. With this plugin, you can create a pixel perfect, high-end websites within a couple of minutes. Beaver Builder is one of the most powerful drag & drop WordPress page builders. It helps you to create beautiful web pages without any coding knowledge. This plugin comes with both the free and premium version. The plugin comes with plenty of page templates so that you don’t have to create a design from scratch. It gives full control over your content. It is front-end editor that allows you to see the changes while editing itself. This plugin lets you add CTA buttons, videos, contact forms, audio, HTML, photo, and much more. You will be able to get powerful controls when these modules display. Beaver Builder is extremely responsive and allows you to work effectively on all the devices. This plugin includes templates for both the landing pages and content pages. This plugin works fine will all the themes but really shines bit ahead when you use Beaver Builder theme. The premium plan comes with the theme as well as some plans gives you multi-site capabilities. The plugin works extremely fast and gives you an onboard tour to help you get familiar with the interface. This plugin is deeply integrated with WooCommerce plugin, so creating E-commerce pages are very easy. Beaver Builder comes with 27 well-designed templates, 19 advanced modules and allows to use shortcodes from other plugins. The theme is updated with the Gutenberg editor. It includes other features such as custom CSS, 400+ icons, 800+ Google fonts, slider editing, global elements, save and import/export templates, compatibility with other WordPress widgets and shortcodes, multiple templates, and lot more. Divi is highly popular drag & drop WordPress page builder plugin. This plugin comes with a bundle of features and has 20+ premade layouts, 46 content modules so that you can add pricing tables, testimonials, portfolios etc to your website. It has a unique feature called “Split test” which gives you the authority to split test unlimited modules, rows or columns. This plugin is powered by Elegant Themes and one of the most powerful plugins in the market. This plugin is compatible with all the themes and plugins. It is a premium plugin starts with a pricing $89 and the higher end price for $249. The plugin comes with both front-end and back-end editor. The front-end editor allows you to make live changes, whereas the back-end editor lets you get the perfect layout. Divi builder comes with tons of customization options along with the option to use custom CSS. With the help of this plugin, you can save your layouts in the divi library and can use it for later purpose. This plugin also comes with 3 section types and 20-row types to give an endless design. Another notable feature of this theme is “Global items” that make your page designing process very simple and saves your time. Use of this Global items feature is that you can set an element or a column as global and then whenever you edit that element or column, the changes are applied to all the pages where you have added that column. You can design your page as you wish without even touching a single line of code. The plugin is completely responsive and works out of the box. The plugin is integrated with E-commerce and you come with ready for translation. Few modules included in this plugin are an audio player, accordion, bar counter, comments, divider, email optin etc. You can even add your own custom CSS to enhance your own unique design. The plugin includes other features such as unlimited undo and redo, lock and disable elements, copy & page elements, control column and row spacing, import and export templates, and lot more. Brizy is yet another powerful and popular WordPress page builder plugin. The plugin is available for free in the WordPress repository. The plugin is available for free as well as premium version. The Brizy Pro version comes with latest features where you can create a custom page without any effort. Everything comes in handy because of its simple drag & drop feature. This plugins interface is different compared to other builders because it shows only the required task and hides everything. The plugin is very simple to use, but yet more efficient. To work with this plugin you don’t have to be a web developer or designers, even beginners can work with this plugin without any distractions. The plugin comes with a notable feature Global styling options, where you can change all the texts that share the same properties, similarly, you can even change the color. There are 150 pre-made blocks in this plugin where you can the premade block designs to your page and can customize it as per your requirement. With the help of these blocks, you can create the main structure of your page in a couple of minutes with a stunning look. The Brizy Pro comes with advanced features such as premium designs, dynamic content, header & footer, popup builder, role manager, white label, A/B testing, advance forms etc. In the pro version, you will be able to easily integrate with the third party plugins like MailChimp, Zapier, Unsplash, Autopilot, Drip, and much more. There are nearly 16 versions in the Brizy Pro. The team keeps on upgrading the plugins with the latest advanced features. The plugin is completely responsive and works effectively on all the devices. The plugin is compatible that works fine on all the WordPress themes and plugins. One of the leading and best page builder that everyone must try. The plugin is extremely reliable and very user-friendly. It comes with excellent customer support where you can clear your doubts and issues 24/7. Themify builder is yet another most popular and powerful WordPress page builder plugin. The plugin comes with responsive website layouts using the drag-and-drop framework. The plugin comes with both the free and premium version. Starts with a pricing $39.The premium version In the free version you will have only 20 useful modules. Themify builder offers you both front-end and back-end editing. With this plugin, you can import and export the modules/layouts, copy, paste or duplicate the existing modules. The plugin has 40+ pre-built layouts and 60+ animation effects so that you can build wonderful pages without starting from scratch. You have just imported the layouts you wish to use, replace the images and text. This plugin is compatible with all other WordPress themes and plugins. This plugin integrates well with WooCommerce, MailChimp, Yoast SEO, Disqus, and Jetpack. To styles your page you have unlimited Google fonts, video backgrounds, colors, customizable designs, support shortcodes etc. The plugin comes with well-written documentation and video tutorials which is very effective. This plugin comes free with all Themify themes. The plugin comes with responsive elements and this plugin works fine on all the devices and it is mobile optimized. If you want to extend the functionality of this plugin you can install the add-ons offered by Themify. Each add-on costs around $10. When you go for pricing of $39, then 21 addons are included in this plan. This plugin includes features such as SEO friendly, WMPL page translation, import/export feature, shortcode and HTML support, multisite support, cache system, content modules like blog posts, testimonials, videos, text. The add-ons of this plugin include infinite posts, background video slider, progress bars, slideshows, typewriter effect, A/B image display, counters, timelines etc. Page Builder by SiteOrigin is one of the leading WordPress page builder plugins. The plugin comes with a simple content creation interface for creating responsive page layouts using the widgets. The theme is completely responsive and works effectively on all the devices. SiteOrigin is compatible with all the themes and plugins. You can drag and drop the widgets in the content area, rearrange, reorder easily. The widgets style can be customized can be divided into three categories such as attributes, design, and layout. The plugin comes with both the free and premium version, where the paid version starts from $29. SiteOrigin comes with both back-end and front-end editing wherein the front-end editing you can see the changes lively. The plugin is very easy to work with and allows you to customize and add your own CTA button, galleries, post button, price boxes etc. The plugin is the lightweight, very good user interface and SEO friendly. Certain features are locked in the free version, that means only by premium versions you will be able to unlock those features. It has 20 basic widgets for you to use and you can even add additional widgets from other WordPress plugins. In the premium version, you have an add on SiteOrigin post type builder which allows you to enhance your website further. SiteOrigin comes with a history browser that allows you to easily undo your changes. The plugin includes additional features such as grid-based output, unlimited colors, styles, custom CSS, enabled on any page or post, and much more. Visual Composer is the well-established page builder on the market. It is one of the oldest builders when compared with other plugins. This is formally known as WPBakery page builder. It gives both front-end and back-end compatibility. Front-end editor gives you real-time results as you edit your website, whereas the back-end editor gives you grid-based interface with modules to drag and drop. WPBakery is included in many themes and plugins that enhance many features. This plugin comes with 40+ elements and 60+templates, 19+ custom layouts, 140+ animations, 5000 icons. You can extend the plan as per your need with WPBakery 200+ add-ons. It is a freemium plugin where the pro version starts with the pricing $59. This plugin increases your visibility with Yoast SEO plugin and WooCommerce integration. It is a strong plugin developed by the team of WPBakery. Though the plugin is easy to use, it comes with a bundle of features that is helpful for the intermediate and advanced web developers. A new feature called “Tree view” is added which lets your builder turn into a layered interface like Photoshop or Sketch Layers. This plugin works out of the box and helps you to edit your logo, menus, footers, sidebars, headers, and so on. You have an amazing plan to redo the presence of any component on your page. You can include functionalities such as parallax effects, slideshow, merry go round, zoom in/out, angle, video etc. Thrive Architect is a powerful content builder that helps you to create a beautiful web page. It allows you to easily and quickly edit your WordPress website. The developers of this plugin are working hard for the WYSIWYG(what you see what you get)functionality which brings editing to the next level. It comes with a simple click to edit option. The plugin works on front-end editing which is very lively. This plugin allows you to add CTA buttons, responsive pricing tables, social media, testimonial elements etc. With the help of this theme, you can create landing pages, homepages, long sales pages, blog posts, and product launch pages. Thrive Architect is very responsive and fits to all the devices. The plugin comes with 150+ landing page templates and the plugin is being updated constantly. This is a premium plugin where the pricing starts at $67. The membership of this plugin offers $19 per month. The plugin is mainly developed for conversion-focused websites. This plugin is compatible with all the WordPress themes and plugins. It includes additional features such as font customization, revision history, custom HTML/CSS, hover & animation effects, integration with 15 email marketing services, very fast editing, flexible custom layouts, creates and save your own templates etc. Overall an effective plugin to use and worth spending money on this plugin. Using page builders has become a trend for the WordPress developers since they find it very easy to work with. You will feel effortless working with these page builders. You can create wonderful web pages without any hassle. All these mentioned plugins come with a responsive layout, front-end editing, and the number of predefined templates with completely reduces your time and effort. Now it’s your turn to choose the right page builder for your website as per your needs. Hope you got an idea about the best drag and drop WordPress page builder plugins for your website. If you have any queries or if you find any other best page builder plugin that is not mentioned in this list please feel free to share with us. You can subscribe to us at Facebook and Twitter.